1. First Mile – how the sender of a remittance payment decides where and how to initiate the transfer. 2. Transfer (intermediary stage) – several financial systems combine to transfer funds. 3. 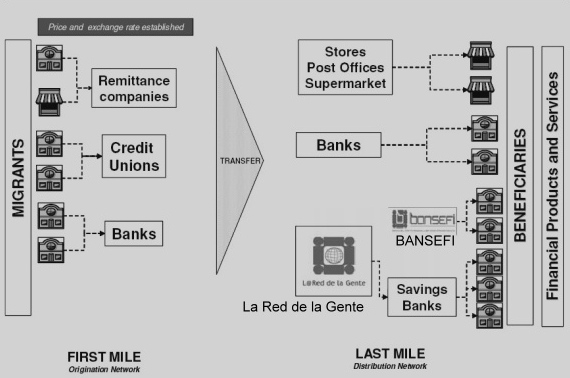 Last Mile – how the recipient gains access to the funds that have been sent. This post looks at the “First Mile“. What factors influence the choices made by the sender of the remittances? The World Bank researchers conclude that several factors are important considerations for the senders of remittances. the ease of access to formal channels. Is there a bank or credit union close to where they live or work? their level of financial awareness. Many migrants have limited experience of international financial transactions. Many do not have bank accounts. the perceived reliability of the service. Many Mexican do not trust banks. familiarity with the company providing the service. This is strongly influenced by “cultural” familiarity. Sending a wire transfer from a US branch of a Mexican supermarket chain, for example, might be preferred over a US bank with an unfamiliar name. the desire for anonymity. Using formal channels requires photo-identification. Some migrants prefer informal channels for this reason alone. their knowledge of “the Final Mile”. If they are sending funds to a remote village, far from a bank, they may opt to rely on a friend or relative carrying cash on their behalf back to their families, rather than involve their family in a lengthy and potentially costly trip to the nearest bank. This factor is becoming less of an issue. In recent years, formal banking channels have extended into many (though not yet all) small towns in the migrants’ home states in Mexico, offering recipients of remittances easier access to funds sent through formal channels. Remittance senders have to take into account the relative expenses associated with competing transfer options. The average cost of making transfers has dropped dramatically in recent years. The sharpest falls came about a decade ago. For example, the average fee fell from $26.12 in 1999 to $12.84 in 2003, a drop of more than 50%. The Mexican government has policies that encourage lower fees at the recipient’s end of the transfer. Increased competition among private sector companies for a share of the international transfer market has forced prices down. Lower prices have made it less attractive to use unregulated informal methods. In many cases informal methods are now significantly more expensive than most of the options involving a formal bank-to-bank transfer. In order to make it easier for undocumented workers to send funds back home safely, the Mexican government issues an official identity document through its consulates in the USA. Mexican consulates began issuing these certificates as long ago as 1871! The certificates are now called the Matrícula Consular de Alta Seguridad (MCAS). The Mexican government negotiated for their acceptance by US authorities, including homeland security. The current high-security version of the MCAS, recognized by international law, is accepted in more than 30 states, 400 cities, 1,000 police agencies and 280 banking institutions, including Wells Fargo, Bank of America, US Bank, Citibank and HSBC. It has allowed many Mexicans to access, for the first time, formal channels for sending remittances back home. Payment of a processing fee of $26.